The Kenmore Elite Oasis HT 4.7 washer is a large capacity machine that will offer you the ability to clean up to twenty four bath towels in one load. For families with a lot of laundry, the large capacity can save a great deal of time and give you a way to get all of your large items clean in your own home. Save money on your utility bills with the energy efficient top loading machine that exceeds the Energy Star requirements. You can save sixty nine percent of the water used and sixty six percent of the energy that is used to give you an added bonus in your monthly utility bills. These rates are in comparison to a conventional machine using the normal cycle. The Gentlewash Technology on the washer will get your clothes cleaner than a traditional machine. This machine also eliminates ninety nine percent of the bacteria in your laundry. It also has the Timed Oxi option which will give you greater stain fighting capabilities. 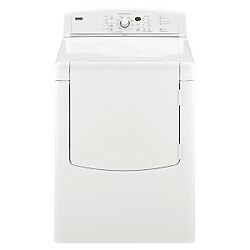 • The machine is an attractive addition to your laundry room. • Efficient machine will effectively treat stains and clean your laundry to save you the trouble of rewashing stained items. • Space saving machine still packs the wallop of a large capacity machine in a smaller overall washer. Kenmore is a name that many people trust for their home appliances. They typically last for many years and will provide the user with a good value for their money. Finding a machine that you can expect to last for ten to fifteen years makes this a good value for your washer dollar. The energy efficiency of the machine make it a good choice for even more savings in your utility bills. The stain fighting features of the machine are a good choice for keeping your laundry free of stains and also obtain a much cleaner result in your laundry. The digital display and the top loading style make it a simple to use machine that is easy enough for everyone in your family to use as soon as you have it hooked up. An extra fast spin cycle will eliminate most of the water from your laundry to give you even more savings in the drying time. Not only does this save you time on your dryer, but it will also save you in your energy bill. In the end, this is a good value for your money. If you are looking for a durable and long lasting washer for your home, the Kenmore Elite Oasis 4.7 washer will give you the capacity and stain fighting that you need for your laundry. The name Kenmore is usually a good indication of a high quality washer.